Whether they’re giving or shopping, the modern consumer expects that, when they spend money online, they’ll be able to track where that money goes and what it pays for. 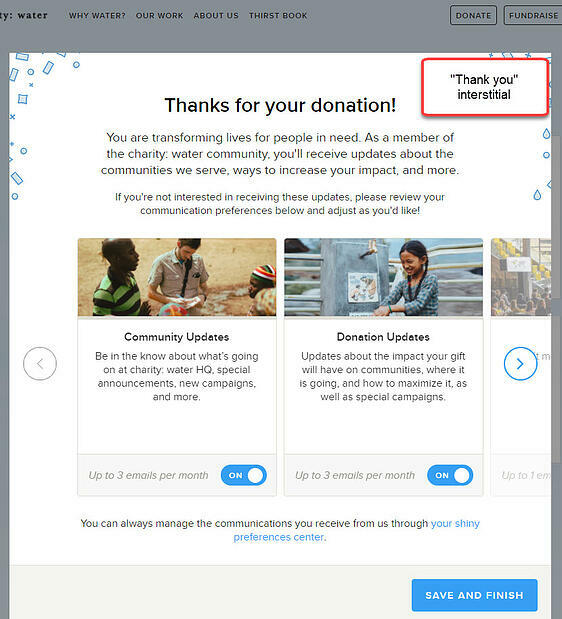 Following the lead of Amazon and other e-commerce giants, nonprofits are now also working to provide transparency and up-to-the-minute updates to donors. In practice, this means that in 2019, a single donor acknowledgement email should be only one piece of a bigger stewardship strategy. Like Amazon sends a confirmation email and shipping updates and a request for feedback, your organization should be using a multi-step strategy to provide maximum transparency and responsiveness. Let’s take a look at charity: water’s acknowledgement process as an example. Immediately following my donation, a thank-you pop-up (in web development terms, an interstitial) appeared, pictured below. This pop-up informed me where my donation was going (“transforming people in need”); what to expect next (“you’ll receive updates about the communities we serve”); and what to do next (“review your communications preferences below”). Within minutes, I also received an email from charity: water. charity: water continues to engage me by being transparent and by following the three critical steps I mentioned above. This helps create that Amazon donor experience. 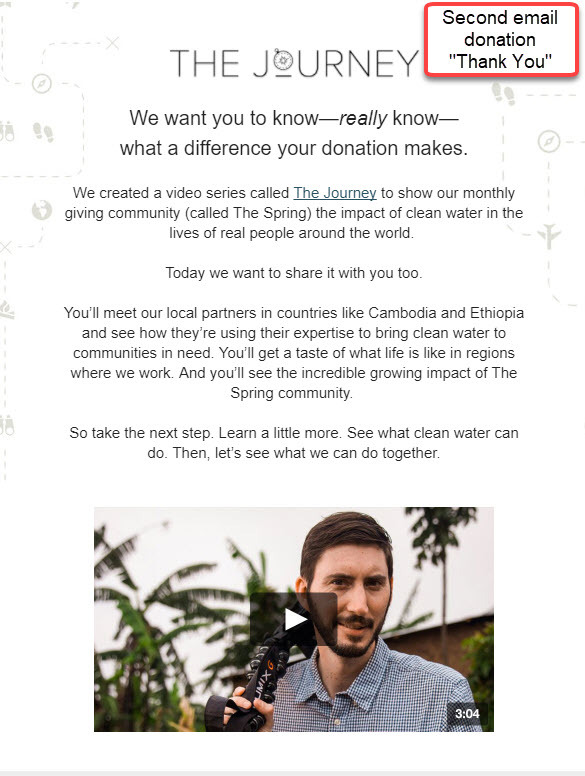 I’ve also included the second follow up email that came just eight days after the original donation and first thank you to show how charity: water continues to incorporate these three steps. And in addition to all fitting into one cohesive plan, these multiple communications channels all use the same coherent, donor-friendly message as the rest of charity: water’s communications, encouraging repeat giving! 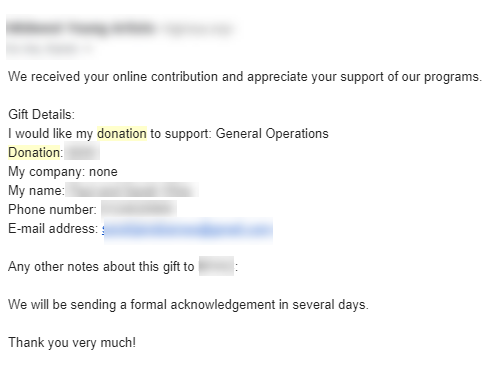 In contrast to the above example, take a look at how these other organizations responded to my gifts. 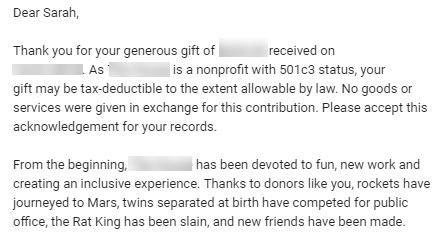 While these emails do everything they need to do, they failed to provide the transparency I expected as a donor. And, they didn’t provide any information that I didn’t already have when making my gift. The more open you can be regarding how you’re using donors’ gifts, the better chance you'll have of creating trust and eventually loyalty. Recently when visiting with my parents, I noticed that my 71-year-old father—far from a technologically savvy guy—only used Siri to conduct his mobile searches. In the last five years, virtual assistants like Siri and Alexa have gone from novelties to essentials. As they’ve become more common, consumers have begun using them more and more, from searching the internet to making purchases. OC&C Strategy Consultants reported that voice-powered commerce accounted for $1.8 billion in U.S. retail revenues in 2017, and this figure is expected to reach an astonishing $40 billion by 2022. A study by Gartner predicts that, by 2022, voice-activated searches will account for 30% of all web-browsing sessions. And while voice activated search is still in its infancy (for example, “hey Siri, I’d like to make a donation to the Red Cross” doesn’t yet land you on a donation page), ensuring your organization is prepared for this evolving technology is critical. Write how your donors talk. With traditional typed searches, users typically only type a few keywords to find the information or product(s) they want. As a result, traditional search engine optimization focuses on only the most important keywords searched. However, with voice search, users will search for a longer string of keywords or even full sentences—and they’ll search in more casual terms. To make sure they retain their place at the top of the search results, websites need to reflect these queries in the content they serve through more casual, conversational language. Optimize location-based searches. If you are a location-based organization—meaning where you’re physically based is relevant to anyone who might be searching for you—make sure your Google business listing is updated as well as any local listings. The keyword “near me” is now universal—and when these two words are included in a voice activated search, Google’s voice search algorithms heads to Google business listings. Dust off your old FAQ pages. Remember that FAQ page on your website? The one you keep putting off updating? FAQ pages carry a lot of weight in search results, surprisingly. Since most voice searches ask a question, using question words like who, what, where, when, and why will help keep your website at the top of the pile, and will help the people searching for you find what they need quickly. Adjusting your site to be voice search optimized will help ensure your institution is visible among all the noise online and well-equipped for the future. A persona is a set of characteristics that reflect a type of “user” (in our case, the donor) that might interact with your institution. 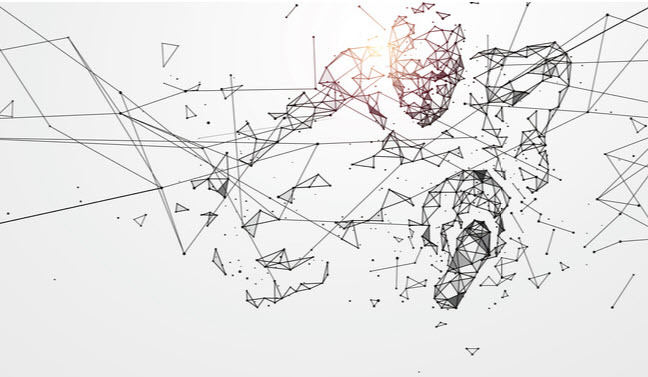 Personas usually draw from multiple sets of variables, including demographics, attitudes, aspirations, interests, challenges, and other traits specific to their relationship with your organization. Historically, personas have been used to help fundraisers and nonprofit communications specialists better segment their donors for customized communications and engagement strategies. A static persona is useful, for a while. But your donors, like anyone else, are always changing. As people age, move to different parts of the country, go up in income level, change careers, change marital statuses, and have children, their needs and interests will change accordingly. Nonprofits need to equip themselves with the ability to meet donors and supporters where they’re at today and tomorrow. By understanding and meeting the changing needs of your donors and supporters, you will ensure that your institutional brand follows suit. Always try to deeply understand your supporters through qualitative and quantitative data, ensuring you have a human-centered approach to your online fundraising efforts. Work to map out your approach and consider ways to pivot to meet the changing needs of your audience. With more than a quarter of the world’s population using Facebook every month, Facebook ads are an obvious way to increase your reach. The big question is how to use them most effectively. What's my budget? For your first attempt, it makes sense to start small, scheduling a few different types of ads and comparing the results of different approaches. Next, what do I want to accomplish? Are you trying to push donations over a short period of time? Are you trying to acquire new followers for your page? Are you trying to sell tickets to a fundraising event? 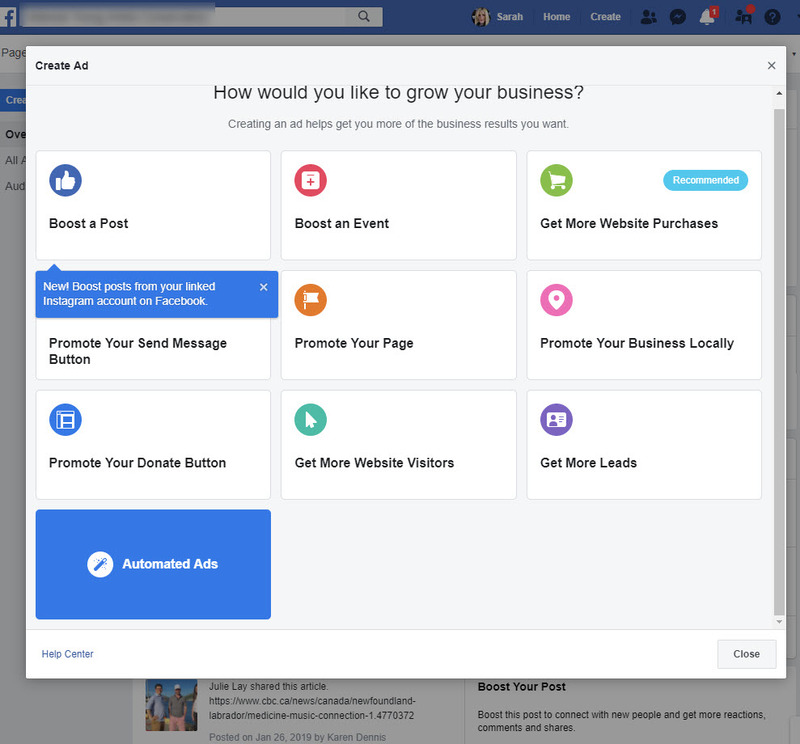 Facebook’s interface gives you several options right off the bat, letting you choose a goal for your ad. Most likely, your objective will determine who you want to reach. With Facebook’s ad tools, you can get pretty granular with your segmentation—for example, you can target donors who are interested in reducing single-use plastic, are into the outdoors, and who make a certain salary per year. Want to target similar segments to your existing supporters? Facebook Lookalike Audiences allows you to target Facebook users who resemble your existing supporters. You can upload a list of your current supporters and then find users like this group, create an audience based on people who like your Facebook page, and use Facebook Pixel to target people similar to your website visitors. If you’re like most, you probably haven’t fully explored all the functions available through Facebook ads. It can be overwhelming at first, but the more you try and test out potential ideas, the more you’ll understand different ways of sharing your message. Want more information? Don’t worry, we’ll be covering more about Facebook ads in subsequent posts. Let us know what you'd like us to cover as well! Leave a note below.